Lindsay Carpenter's class was surprised with a set of Chromebooks at Ridgeview Elementary. One of the 53 Chromebook carts was delivered to Lindsay Carpenter's class at Ridgeview. Director of Schools Kimber Halliburton instructs student Liana Frizzell on the safest way to transport the Chromebooks. Ridgeview Principal Kelley Harrell tells the class about the new technolgoy. Ridgeview students, Connor Loving and Paxton Wells, look over the new technology presented throughout the school system. Principal Harrell helps Cooper Bacon, Ally Barron and Keagan Riffe with their new Chromebooks. 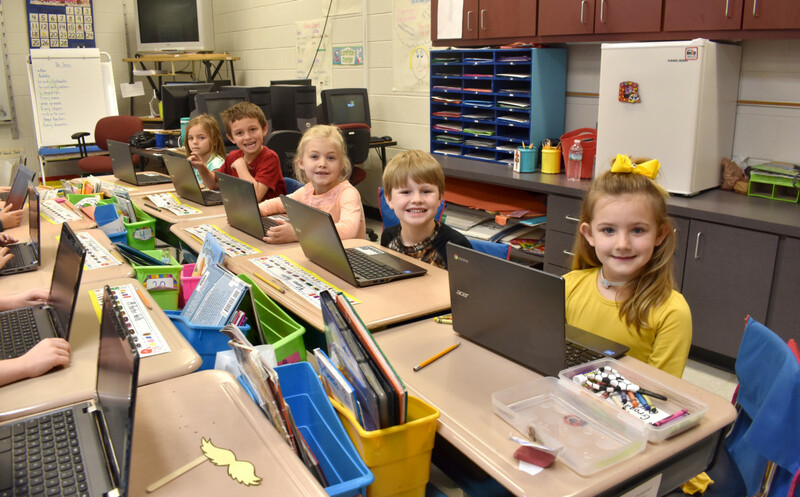 From left to right, Kambria Silvers, Porter Benton, Liana Frizzell, Conner Heaton and Taylor Street get ready to enjoy their new Chromebooks at Ridgeview Elementary.